If you've read this blog before, you know one of the shortcomings of LED lighting is that LEDs, by nature, project light forward. Manufacturers have posed all kinds of creative solutions to this problem, from frosted caps to space station looking spires of LEDs within the bulb envelope. However, one of our favorite brands here at 1000Bulbs.com claims to have solved this problem, at least for reflector bulbs, with a surprisingly simple solution. The LED reflector light bulb market is saturated with Halogen PAR clones. PAR lamps, which are a directional light source anyway, are an obvious format for LED. The PAR format allows LEDs to show off their energy saving potential without addressing the directional problem of LEDs. As a result, LED bulbs such as the MSi iPAR38 have been a big hit, especially with businesses, but not so much with homeowners who prefer the shape of traditional incandescent BR- and R-type bulbs. TCP took this challenge to heart when they created their new line of BR LED bulbs. The "guts" of the incandescent-inspired bulbs are the same as an LED PAR lamp, but the face is capped with a round, frosted lens to refract the light coming from the LEDs. This refraction creates a softer beam spread more similar to that of incandescent bulbs. Plus, when used in recessed cans, the bulbs look just like the incandescents they replace. The light quality of the bulbs is equally impressive. The BR LED line has a CRI (Color Rendering Index) of 85, higher than the usual 80-82 of most LED bulbs. The dimming quality is great, too. TCP has manufactured the bulbs to be dimmable down to 0.5%, and our tests show them to be compatible with both analog and electronic dimmers, which until now, we had never seen on an LED bulb. TCP's new line of LED reflector light bulbs includes BR40, BR30, and R20 LED bulbs, available in 2400K and 2700K versions. The BR40 and BR30 can replace 65 watt and 85 watt incandescent bulbs, respectively. The R20 replaces a 50 watt incandescent. All the bulbs are rated for 25,000 hours and carry a 5-year manufacturer warranty. 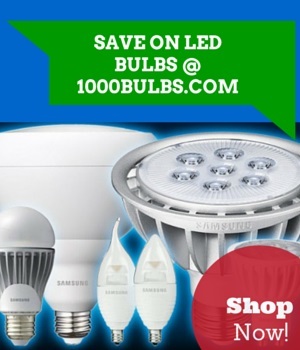 The mercury-free LED bulbs save approximately 80% of the energy used by similar Halogen bulbs.